In this tutorial I will show you how to check the Betaflight firmware target for your flight controller. Different FC might use different Betaflight firmware targets. if you flash the wrong firmware to your FC, you could “brick” the board and unable to connect or flash it again. Although it’s possible to fix “bricked” FC as it’s only a software issue, but it’s inconvenient all the same. Check out this post for more Betaflight Tutorials. A firmware target is a specific firmware file for a particular flight controller. Sometimes multiple flight controllers might share the same firmware target. For example, The Onmibus F4 AIO V2 uses the “Onmibus F4 SD” target, while the DYS F4 Pro V2, as well as the Rotor Riot Control FC also use the same target. This can be confusing sometimes, your flight controller might be called something completely different from the name of the firmware target. You can usually find out what the exact Betaflight firmware you should use from the manual. 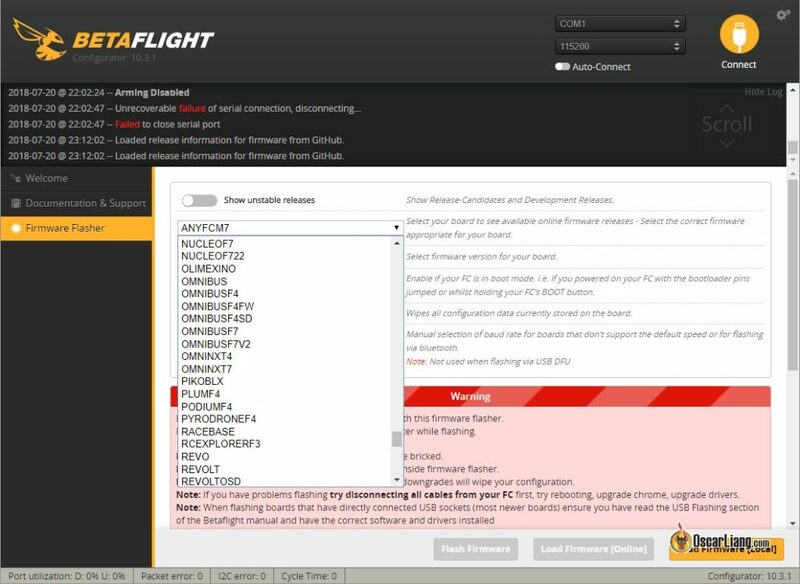 Alternatively, you can check in Betaflight configurator. How to Identify FC Firmware Target? The result tells you what the target and version of Betaflight firmware is installed on your board. It’s that simple :) Happy flying. does anyone know the target for the millivolt osd? I have learned so much from you and I appreciate all of your hard work in sharing your knowledge. My question is on the FRSKYxsrf4po combo flight Controller, power distribution board, and receiver. I checked the version of the flight controller on betaflight. It told be omnibus. So I flashed the firmware and all went well. My question is, since it is FRSKY, shouldn’t I have flashed the firmware from FRYSky? Thank you. How do i know which target to use if i acccidently flashed the wrong firmmware? You describe the way to look at what is installed, not what has to be installed. So what do you get when you type version in CLI? I have looked everywhere for info on oled installation on my drone, with no luck. I have a Kakute f4v2a new oled. the oled led comes on but the screen is blank. I have no idea what to do or check. The I2C connections are correct (scl, sda) I dont know what else go try. Thank you. Question? Are you verifying the firmware FC target name in case there are system updates to download?